India came into the fourth Test match at the back of 137-run victory in the Boxing Day Test. India could not stick to the same XI due to the unavailability of two players. While Rohit Sharma flew back to India to see his new-born daughter, Ishant Sharma was dropped from the side as he got himself injured. To replace Rohit, India chose to bring back KL Rahul as the opener and that meant that Hanuma Vihari was back at No. 6. The other selection move was a bit of surprise as India opted for the second spinner in the form of Kuldeep Yadav. KL Rahul failed yet again as he got out for just 9 runs. The other Indian opener, Mayank Agarwal then stitched a crucial 116-run partnership with Cheteshwar Pujara. Mayank Agarwal played cautiously throughout the innings. He was tested by some serious Aussie short bowling but the young opener managed to score his second Test fifty. Agarwal tried to up the ante after the landmark but got trying to hit Nathan Lyon for a third six. Kohli and Pujara then steadied the innings by adding another 50 runs before the Tea break. Just after the tea break Kohli and Pujara were expected pile on a lot of runs together but Kohli's soft dismissal in the very first over after Tea ended the partnership worth 54 runs. The Indian vice-captain, Ajinkya Rahane then joined Pujara in the middle. Rahane tried his best to stay in the game but a sharp bouncer from Mitchell Starc shortened his stay in the middle. 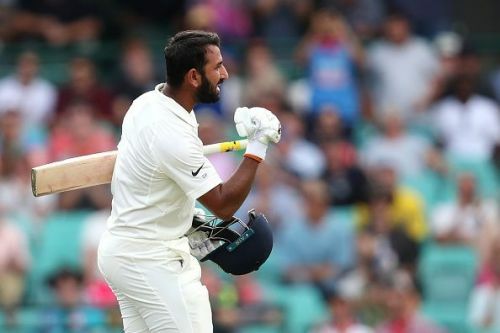 Even with wickets falling at the other end, Pujara did not lose his composure and notched up his third century of the series. After Rahane's dismissal, Pujara and Hanuma Vihari ensured that India did not lose another wicket before the end of the day. In less than 20 overs, they added 75 runs for the fourth wicket. With Vihari scoring some quick runs and Pujara batting solidly at the other end, India will look to go past the 450-mark on Day 2. You blink your eyes, KL Rahul gets out. Outside edge, squared-up, inside edge, outside edge, defended off back foot, outside edge (gone). You look at the tired Australian bowlers, it is a result of the last Test where India had them out for two days. Test cricket is tough on the body. Why isn't Pujara doing push ups? You know you are below average when Pujara is smacking you for three fours in an over in a Test. Once Agarwal has 10 Tests under his belt and gets comfortable that he belongs, watch him revolutionise opening batting. Both Pant and Paine can go to Dhoni to babysit and learn about DRS? KL Rahul knows something very bad about Kohli or Shastri. Virat Kohli: What was the need to bat at a strike rate of 150 and lose your wicket? 15 years after Steve Waugh played his last Test against India at the SCG, his son Austin is carrying the drinks & reserve fielder.